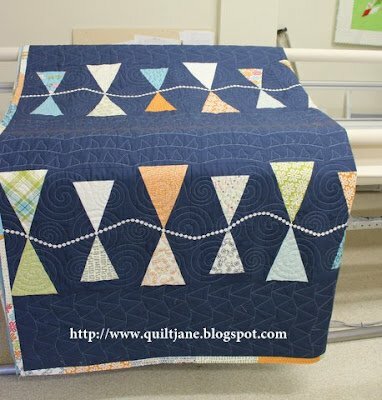 "I am always excited to share a project with you using the beautiful fabrics from Moda. Today's project is using a marriage of a Bella solid - American Blue 9900-174 with Sweetwater's Lucy's Crab Shack. This collection is a wonderful mix of colours suitable for both girls and boys. "The triangle blocks used in this projects are cut without templates. Therefore each block may have a unique character. 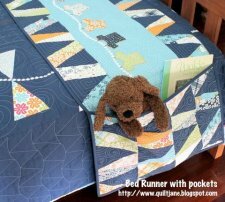 "The quilt and runner were designed for a king single bed (mattress size approx. 42" x 80")." 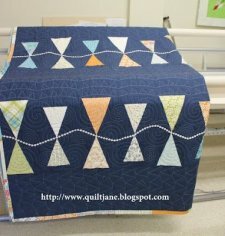 Be sure to visit Jane's Tutorials Page, which has lots of freebies for you!